Tebasaki Karaage ('手羽先唐揚げ', is classified into deep-fried food), is known as Deep-fried Chicken Wings in English, and 唐扬鸡翅 (Táng yáng jīchì) in Chinese. Tebasakiage, Chicken Wings Karaage, Fried Chicken Wings. 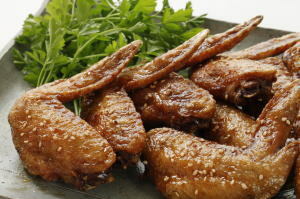 Chicken Wings, Ginger, Garlic, Soy Sauce, Wheat Flour. Potato Starch, Sake , Mirin , Sugar.